Here I post video that illustrates paddle- and safety technique. So far, there is not much to show, but I'm planning a lot of new rolling video as soon as the water is clear of ice! Some shots from the great adventure. We used Gopro and Canon S95 for these shots! 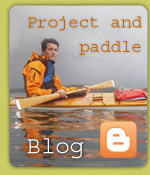 A small glimpse of the joy of baidarka paddling - watch and enjoy! A small example of a video made with my Olympus Mju 8000, attatched to the foredeck of my red rolling kayak. Just for fun, and to explore the camera's possibilities. First paddle video made with my brand new Nikon Coolpix. Top of the line in 2001 with possibility of 40 seconds Quicktime movie shooting. I demonstrate self rescue in Alex's new built baidarka. The shoot unfortunately ends when the clip has lasted 40 seconds!